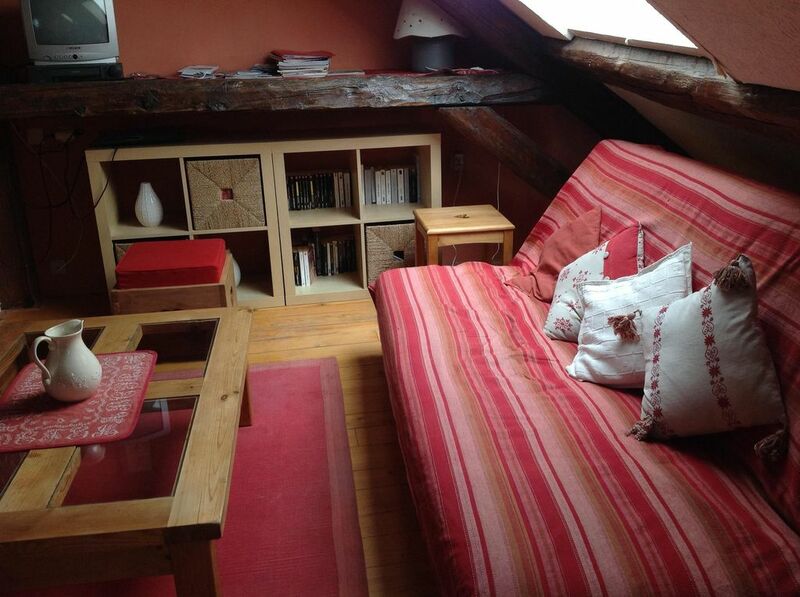 This beautiful apartment is in the old town of Briancon. The apartment is on the 5th floor of a 300 year old house. Unlike many houses in the old town this apartment has amazing views of the valley and loads of light. It is owned by a young lady who lives there alot and so it is a place to live in, it is not a typical French ski apartment. Everything in the apartment is as you would like at home, natural wood floors, wood beams and ceilings, large fire, beautiful kitchen with all mod cons (juicer, steamer, gas hob, and an amazing view of the mountains!) The beds are comfortable and new and the whole apartment was only redecorated and refurnished in August 2007. The bathroom has a large walk in shower with loads of space and comfort. This apartment is only a short drive from some of the best ski stations in the Alps and is the centre for white water canoeing in the Alps. The apartment comes with wood and heat included and is a must stay for anyone. The apartment has 3 seperate bedrooms, one main bedroom downstairs, and two on the mezzaine. While it is a great apartment for family’s, it does not have an elevator. "A lovely, quirky property with great views across the rooftops." "Brilliant location and good communication. Fantastic Holiday was had by all"
"Rented the apartment as a base for two weeks of skiing in late January 2008 and would recommend it. Lots of good skiing in Serre Chevalier and you're only 30-100 minutes drive from either the Milky Way resorts (Montgenevre, Sestriere, Sauze d'Oulz, etc) or La Grave/Deux Alpes and Alpe d'Huez in the other direction. The setting in the Cité Vauban area of Briancon is stunning - worth the trek up all those stairs! The apartment is comfortable and the kitchen well equipped, although there's also plenty of good places to eat nearby. The master bedroom is very spacious, with the other two main sleeping areas created by a screen dividing the area of the mezzanine balcony - one of which is open to the living room below, where there is also a sofa bed. Although a car is preferable (paid parking during the day just down from the apartment, free from 6pm-9am and 300 free places at the top end of Vauban), it's 15 mins walk to the Prorel gondola and Briancon centre, while there's also a bus stop (unfortunately not part of the ski bus loop) just outside the city walls. The owner is very helpful with directions, maps and recommendations if needed." This flat is perfect, cosy, confortable, nice decorated, extremely well located, in the old charming town of Briancon but closed to the ski lift aswell. The view on the mountains + old town is amazing. And the owners are lovely aswell ! 6/5 for the rental property ! Io, la mia ragazza e altre due coppie abbiamo trascorso 5 notti a cavallo di Capodanno in questo bell'appartamento in pieno centro storico a Briançon. Lati positivi: grande disponibilità della proprietaria, cucina attrezzata provvista anche di lavastoviglie, ampio spazio comune con divano e tv e fantastica vista sulle montagne. Lati negativi: appartamento al quarto ed ultimo piano (senza ascensore), acqua calda che funzionava a singhiozzi (se si faceva partire la lavastoviglie dopo pranzo, l'acqua calda finiva subito e si doveva attendere il mattino successivo per poterla riutilizzare). Assolutamente consigliato! Prezzo modico e location ottima e comoda. Nous avons passé une semaine merveilleuse dans l'appartement qui est baigné de lumière et bien situé, dans la vieille ville sans etre trop loin des remontées mécaniques. Nous avons notamment beaucoup apprécié les vues de l'appartement. The old town itself is an old fort and you have to enter it via an old fort gate. Our apartment is at the bottom of the town just 2min form a large parking area.